Check visibility: Add de-icer to windshield wiper fluid. Make sure windshield wipers are free of ice and consider getting new flexible windshield wipers. Make sure mirrors are clear and adjusted. Clean headlights and check bulbs in all vehicle lights. Slow down, stay back: When driving in snow or ice, drop your speed and leave extra distance between your vehicle and the one in front of you. Don't use cruise control on icy roads. 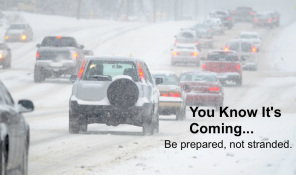 Use special caution on bridges, overpasses, infrequently traveled and one lane roads. Skidding safely: If your rear wheels skid, take your foot off the accelerator. If your rear wheels are sliding left, steer left. If they're sliding right, steer right. If your rear wheels start sliding the other way, you'll need to steer the other way. You may have to steer left to right a few times to get your vehicle under control. If you have standard brakes, pump them gently. If you have anti-lock brakes (ABS), do not pump them, apply steady pressure. If your front wheels skid, take your foot off the gas and shift to neutral, but don't try to steer immediately. As the wheels skid sideways, they will slow the vehicle and traction will return. As it does, steer in the direction you want to go, then shift the transmission into "Drive" or release the clutch and accelerate gently. Preparing for snowfall: If your vehicle has rear wheel drive, put bags of sand or kitty litter in the trunk to help make the vehicle easier to control. Pack a kit in case you get stuck, including such items as a blanket, gloves, hat, water, granola bars, flashlight and extra batteries. Flares, wooden matches in waterproof container, scissors, rope, compass and first aid kit are all necessities too. Prepare a toolbox for digging your car or truck out with a foldable shovel, 2x4 planks to put under your tires, an ice scraper, snow brush, reflective triangles, flares and exterior windshield cleaner. This information provided by CARSTAR Auto Body Repair Experts, North America's largest multi-shop operator network of independently owned collision repair facilities.